The previous verses of Chapter 2 founded the three Mothers on a mediation between fullness and emptiness, and then described a series of engraving, carving, weighing, permuting-transposing-inverting, combining- amalgamating operations of the twenty-two Autiot as a whole, which result in the formation of the soul of everything that is, or ever will be, formed. Verses 4 and 5 describe the initial set of permutations of the individual twenty-two Autiot as the 231 Gates, where each letter is taken with every other letter (231), in each direction (462). These operation are within the sphere of Hhockmah, where the Twenty-two Autiot-Yassod are the first engraving. Once again, the dual flow of energy is right in front of our faces, if we could only see it. The wheel turns in two directions and energy "oscillates" between two poles, in "cycles." Not only that, but there is no stability (good) better than structuration, and no instability (evil) worse than the dissolution of structures in indetermination. Energy runs in two directions, building-up (Aleph-Bayt) or tearing-down (Bayt-Aleph) structures. The other unrecognized for-good-reason core theme in these verses is the explicit Aleph with everything and vice-versa, Bayt with everything and vice-versa statement. Think about it: an un-containable Spiritual component with everything (and vice-versa), and a material container component with everything (and vice-versa) and you can see why. 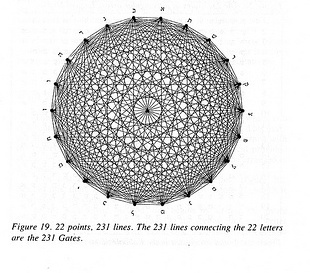 2:4: Twenty-two foundation letters: They are set in a circle as 231 Gates. And this is the sign: There is no good higher than delight (ONG), and there is no evil lower than plague (NGO). 2:5: How? Weigh them and transpose them, Aleph with each one, and each one with Aleph; Bet with each one, and each one with Bet. They repeat in a cycle. Therefore, everything formed and everything spoken emanates in one name. 2:6: Form substance out of chaos and make nonexistence into existence. Carve great pillars out of air that cannot be grasped. This is the sign: One foresees, transposes, and makes all creation and all words with one Name. And a sign of this: Twenty-two objects in a single body. 2:4 And all of them oscillate cyclically. (19A) Twenty-two letters: he carved them out, he hewed them, he weighed them, he exchanged them, he combined them and formed with them the life of all creation and the life of all that would be formed. (19b) How did he weigh and exchange them? -- Aleph with them all, and them all with Aleph. Bet with them all, and them all with Bet. And they all rotate in turn. The result is that [they go out] by two hundred and twenty-one [gates]. The result is that all creation and all speech go out by one name. (22) He looks and exchanges; he makes all creation and all speech one name. And a sign for the matter: twenty-two objects and one body. 2:4 Twenty-two Autiot-Yassod fastened Belgalgal (to a turning wheel) by two hundred and thirty-one Schaarim (portals, values or measures) and the wheel turns forwards and backwards. It is a token of the language. Nothing in Tov is superior to Aanag (pleasure or coitus) and nothing in Raa is inferior to Nagaa (plague or leprosy). 2:4: A wheel which causes the Autiot to revolve two hundred and thrty-one times in two directions turns it 2 x 231 = 462 times. This is the number derived from combining each of the 22 with the 21 others. The text adds that the key to this language is "The front and the back." For example, the combination Aleph-Bayt leads towards structuration; the combination Bayt-Aleph goes in the opposite direction. This key must always be used when interpreting the words as eqations. The to-ing and fro-ing of the Autiot passes from one pole of energy to the other, keeping the balance. One of the poles is Aanaq: 70.50.3. It is the trajectory from the indeterminate that is going to animate the archetype of organic movement. The other is Naqaa: it leaves the existence of organisms in order to reach indetermination: 50.3.70. This dual current is constructive and no "Tov" (good) is superior to it: it is destructive and no "Raa" (evil) is inferior to it. What is interpreted as Good and Evil are two sides of the one vital energy in motion, and that motion is apparent in the language of the Autiot. 2:5: Intemporal life and physical support in everything existing and in everything coming into being, including the word. Whirlwinds of energy born on One. The concluding verse, 2:6, returns to the Autiot as a group, "twenty-two elements in a single body," as the "One Name" with which all words and all creation are made with energy sleeping in inorganic matter. Formed with formless substance material reality and made universe (the whole system) (from) sleeping (zero-point energy). 1:11 Three: Maim Merouahh Hhaqaq Vehhatsav (legislates or organises and chisels or cuts) with (in) them Tohou and Bohou. In Refesch (mud) and Tith (clay), organises as a kind of flower-bed (garden), hewn as a kind of wall, and covered as a kind of roof. primordial matter assumes three dimensions in the depths of stability (Oomq Tov). It is easy to be put to sleep by words like substance, chaos, existence, non-existence, which make us think we understand what we are reading, only to awake with the uneasy feeling that something has eluded us. Reading the comments of this or that Rabbi only seems to put us further from the text, and understanding. The problem with all the idiomatic translations can be summed up in one word: Ayn, translated "nothingness," but actually an equation for the total whole, or everything. Aleph and Yod are the Two Partners in the great Game of Life. Aleph (infinite consciousness/energy beyond space-time) and Yod (space-time and duration) projected into/realizing all possible possibilities in cosmic indetermination (Noun) is much more than we can imagine. So, if we mistake everything for "nothing" is it any wonder we confuse sleep with "existence?" Yaschnou, Yod-Sheen-Noun-Waw, 10.300.50.6, shows energy (300) trapped or imbedded or asleep between existence (10) and a factual life (50), persisting (6) but without an organic process. 2:6: Yatsar (formed) with Tohou Mamasch (material reality) and Aassa (make from) its Ayn (Aleph-Yod-Noun, general equation of the universe) Yaschnou (its slumber) and hewed (or chiselled) great pillars (or pages of a book) with the air (or atmosphere) for its Ayn to seize (plural) and that is the proof (or sign) of the watcher (Tsofah). With what is being projected is made everything that is formed (just as) the words (everything is) One Name and the proof of the saying: twenty-two elements in a single body. 2:6: This last verse of the second chapter concerns emanation, one of the principle themes of the Qabala and of the Hebraic tradition in general, in virtue of which monotheism, although it is a deviation, never fell into pantheism. The key words in this verse are, in the first place, Ayn, the whole, officially translated as nothingness (just as we have seen above), and Yaschnou (from Yoschan: old age, antiquity, or, rather, from Yaschen, to sleep, more suitable to this context, we think. We are are thus a long way from the recognised translations, according to which "he" made "nothing from something." The text does not require personal first names, and for grammatical reasons we have avoided introducing them. This sleep is not Brahma's mythical sleep. It is the statis state of energy living in inorganic matter.